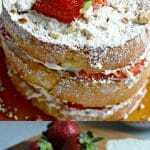 This Strawberry Cream Stuffed French Toast Recipe has it all – delicious french toast, fresh strawberries, a slightly sweet cream cheese filling, and topped with powdered sugar. This is perfect for breakfast, brunch, lunch, or dinner, and your guests are sure to love it! I have to admit that I was never really into “sweet” breakfasts until I moved to the United States. In Mexico, it is much more common to have savory breakfasts, like these delicious red chilaquiles, or these huevos rancheros. That said, I have now been here for over 6 years, and as a result I have expanded my horizons and now I enjoy these sweet breakfasts too. For example, one of my favorite breakfast items now is the always delicious Bananas Foster French Toast that I tried for the first time last year when my husband and I were celebrating our anniversary with a weekend getaway. Another favorite of mine are these sweet crepes with white chocolate whipped cream. As you can see, I no longer limit myself to savory breakfasts and I am always looking for new sweet breakfasts to make for my family and to share with all of you. 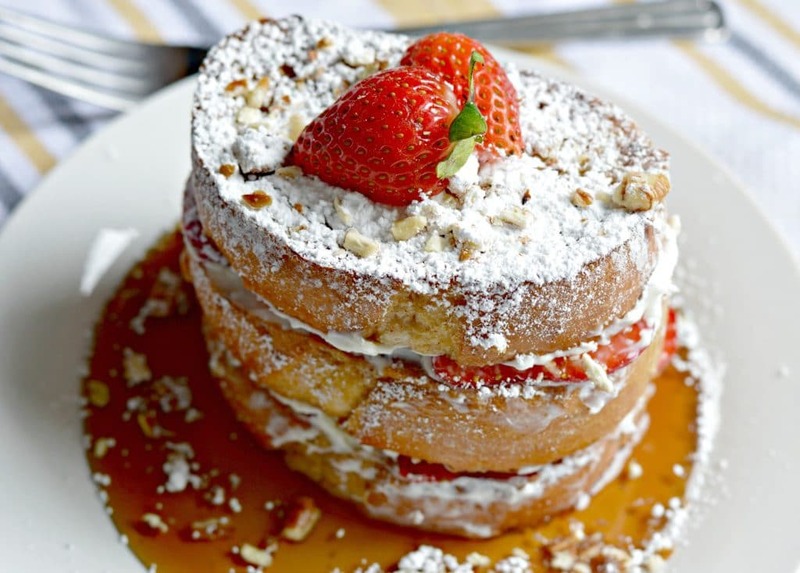 The recipe that I want to share today is also a french toast recipe – but this one, unlike the bananas foster version, is stuffed with an amazing cream cheese filling and strawberries and topped with powdered sugar and syrup. If you know how to make regular French toast, then making stuffed French toast is going to be easy for you. That is because you start out by making French toast like normal, and then you spread a layer of the cream cheese and strawberry filling, before adding at least one more layer of each. The end result is a breakfast that people will be talking about forever! One of the secrets to having a good French toast is having a great bread! For the stuffed French toast in the image above and below, I used a freshly baked French loaf that I got from my local grocery store. The bread shown in the process images were brioche, which is also delicious! I hope that you enjoy this recipe – let me know how it turned out in the comments section below! 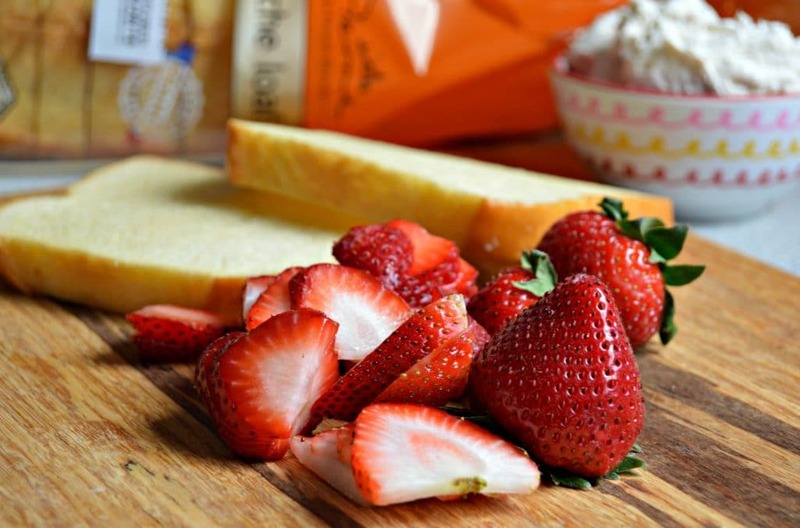 Combine all of the ingredients except for the strawberries and beat until creamy. Set aside. 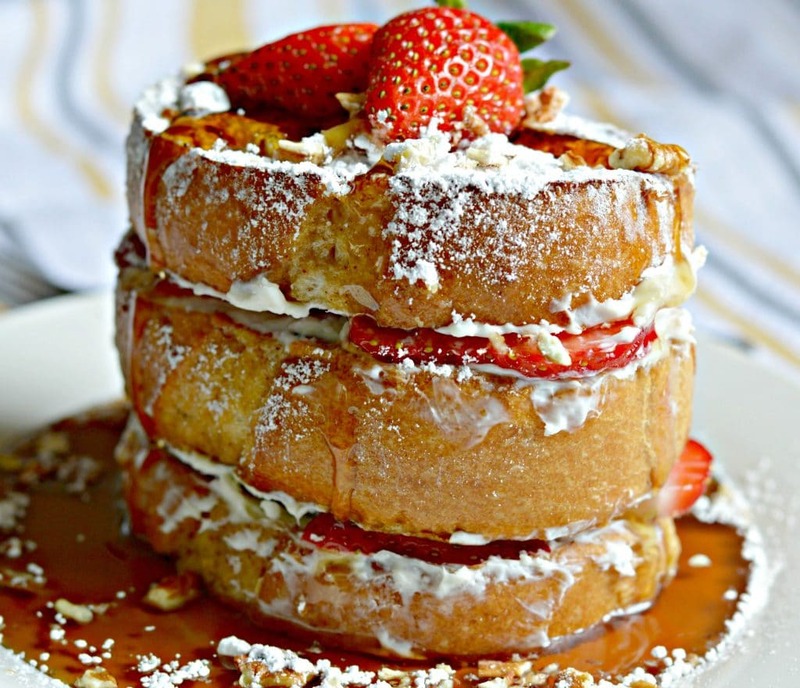 You will add the pieces of strawberry separately in between the slices of French toast and on top. 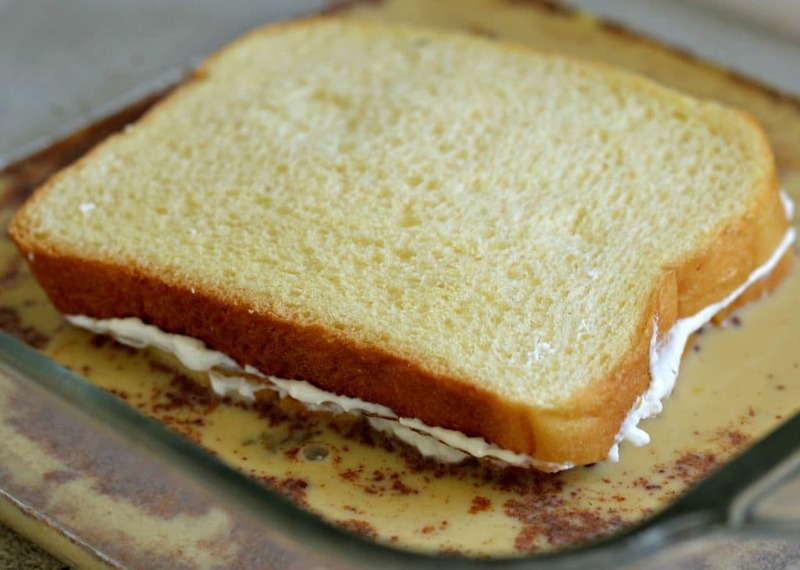 There are a couple of ways to do this, but in each you will need to start by combining all of the ingredients except for the butter and the bread and stirring well. 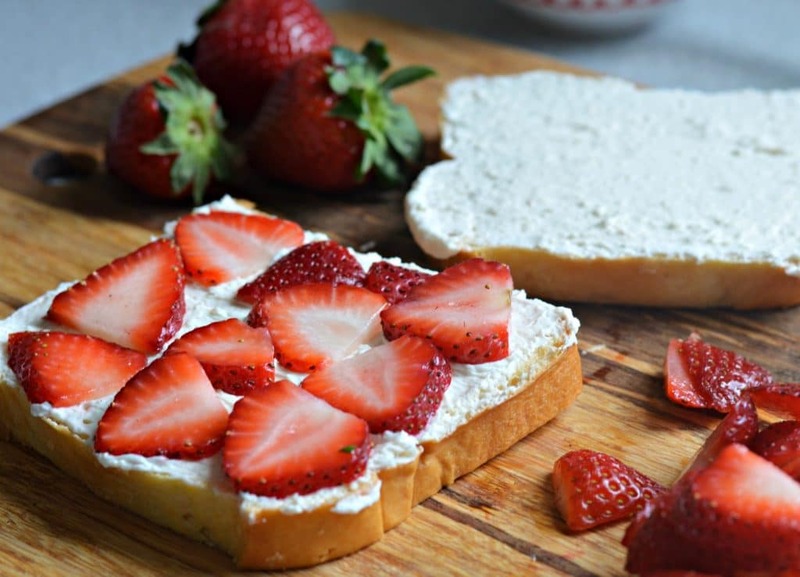 This first option only works if you want to make a stuffed French toast with only 2 pieces of bread, start by laying one piece of bread on a plate and add some of the filling mixture and few strawberries, and then top with the other piece of bread. Now, carefully submerge the whole thing (both pieces of bread, with the filling) into the egg mixture, making sure to cover both sides completely. Then, melt the butter in a skillet and add the French toast, cooking well on both sides until it is as done as you want. The other way to do this is the cook each piece of French toast separately, and then adding a layer of the filling in between each piece of bread. This is the way that you will want to do it if you are doing two or more layers of bread. Once cooked, top with syrup, powdered sugar, and more strawberries and enjoy!